This will make a handy alternative snare, with a distinctive quality. Pretty looking and warm sounding with an unmissable sweet spot. It might not be your primary snare choice, though. The name Black Panther, conjuring up speed and power allied to velvety sleekness, has been a winner for Mapex over the past decade. Now Mapex has given the entire range an overhaul with 14 brand new models. 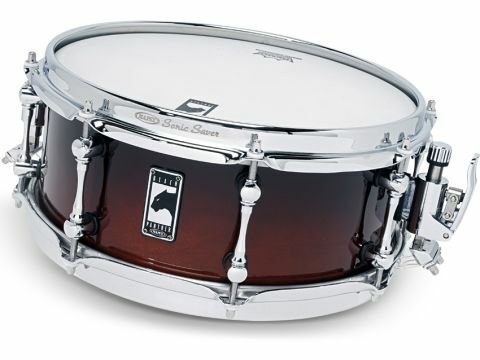 You can read every Black Panther snare drum review here. Each drum has either single-ended shield-design cast lugs, or elegantly sculpted twin-point mounted tube lugs. The patented 'Sonic Saver' hoops lie between flanged and die-cast hoops. Recalling the classic Slingerland 'Stick Saver' concept, the top lip of each pressed stainless steel hoop bends over and in, not out as on standard hoops. The handsome throw-off is a smoothly operating pull-away lever with adjustable strainers at both ends. Micro lock knobs click silently as you turn them for sensitive adjustment of the stainless steel wires. There are several new bearing edge profiles, and capping it all a new die-cast, chrome-plated Black Panther badge. You can watch a video overview of the new range with Craig Blundell and Steve White below. Scroll down for the full review. As its name implies, the Cherry Bomb is made from cherry wood - and to emphasise the connection the shell is finished in a dark red cherry stain and gloss lacquer. The inside is left a natural warm ruddy brown. The cherry has a pleasingly striated dark grain, offset by the chrome hardware, making this a pretty drum. The thin 5.1mm shell is a compact 13"x5 1/2" and has well-cut, sharp bearing edges. Dropping the diameter by an inch makes quite a dramatic difference to your snare. The sound becomes tubbier and more compact. The cherry imparts a full, plump, right-in-the-middle sort of sound, which is extremely pleasing, both warm and precise. The 1:9 bearing edges with the sharp edge right on the outside of the drum means the sensitivity extends right to the rim. We were impressed by the way the full bodied centre sweet spot extended almost two thirds of the way towards the edge of the shell. It's aided by the single ply Remo Coated Ambassador batter which is ideal for this small drum.